The Beatles and WABC. For a while they were synonymous. And, that is exactly what WABC was hoping for. It was not immediately obvious that The Beatles were going to be such a success. When the WABC disc jockeys first heard "Fab Four" records in 1963, they were hardly impressed. Comments were made like "stupid name for a rock group" and "no way". The WABC DJs were not alone in that assessment. There were many in both the music and the radio industry who felt the same way. Their opinions changed quickly. By 1964 The Beatles had their first number one song in the U.S. with "I Want to Hold Your Hand", followed immediately by "She Loves You". Still, there was enough skepticism about them so that Sid Bernstein, a concert promoter, booked them in Carnegie Hall rather than Madison Square Garden for their first New York concert. It was a mob scene. On February 7 they appeared on "The Ed Sullivan Show" which resulted in the largest television audience for an entertainment program up until that time. The enormous response to these incidents convinced program director Rick Sklar that The Beatles success was going to be WABCs success. Of course, WABC was not the only New York radio station trying to jump on The Beatles bandwagon. So were WINS and WMCA. Competition was intense for everything The Beatles did from releasing new records to their visits to New York. At WINS, Murray "the K" Kaufman dubbed himself the "Fifth Beatle" and WMCA battled WABC for every exclusive. This created one of the great radio station battles of all time. The prize for the station that could ultimately outdo the others and attract that huge "Beatlemania" audience was going to be the ratings winner. And, they all knew it. For its part in the rivalry, WABC was up to the challenge. Specific Beatles jingles were commissioned from PAMS centered around the theme "W A Beatle C". These jingles were attached to every Beatles record played. There were Beatles look a like contests, poster contests, and name your favorite Beatle contests. WABC even gave away a giant photo of The Beatles that was used as a backdrop for the ABC show "Shindig". One of the keys, of course, was to be the first station to play a new Beatles record. All Top 40 music radio stations, not just those in New York, would do anything possible to be the first station to have a new Beatles recording. But there were times when WABC did not wait for a record to be released. Advanced pressings or taped dubs would find their way to WABC. There are various stories as to how this was accomplished. One explanation comes from former PAMS (the company that was then creating WABC jingles) president Bill Meeks. Bill claims he had a contact in England from Radio London who knew someone (the girlfriend of one of The Beatles?) who worked for the recording studio in England that was recording new Beatles songs. She would grab new Beatles discs, give them to the captain of an airliner who would fly them to New York. He would then deliver them to WABC program director Rick Sklar who met him at the airport. Another explanation comes from John Rook, program director of first KQV in Pittsburgh, then WLS in Chicago (both owned and operated by ABC). According to John: "Virtually all of The Beatles exclusives heard on WABC came from my contacts in England....we used to feed them to Rick at WABC." However it happened, whenever WABC had an exclusive it dropped in jingles over the record that said "W A Beatle C exclusive" so it could not be taped and run on competing stations. Frequently an "exclusive" would appear on a Friday night when the record companies had closed for the weekend. This made it impossible for WABC's competitors to get copies for three days. WABC had a huge advantage when The Beatles visited New York City. As the flagship station for the ABC radio network, it had access to lots of high tech equipment. This included wireless RF microphones. During The Beatles first 1964 visit to New York, when they stayed at The Plaza, it was impossible for virtually any of the media to get access to them. So, during their second 1964 visit when they stayed at the Delmonico Hotel, WABC mounted an all out offensive. The suite above The Beatles was rented by WABC and was used to set up a remote studio. 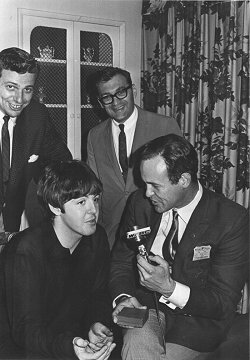 Using those wireless microphones, WABC disc jockeys Scott Muni and Bruce Morrow wandered around the hotel ready to broadcast anything that might have to do with The Beatles. It gave the station a huge edge. And, it didnt hurt that as many security and hotel staff people as possible were presented with "gifts" from WABC. Needless to say, there were very few places where the WABC people could not roam. By now most of the 10,000 teenagers who packed the streets outside of the hotel were listening to WABC on their transistor radios. When WABC disc jockeys Scott Muni and Bruce Morrow asked them to sing WABC jingles as they were playing on WABC, the entire crowd was able to do so in unison. The power of all of this was best illustrated when Ringo Starr lost his gold Saint Christophers medal which was attached to a chain around his neck. Apparently as he was entering the hotel, an over zealous fan inadvertently snatched it. Bruce Morrow and Scott Muni learned this while interviewing him over the air at the hotel. WABC listeners also heard this and so did the girl who had the medal, Angie McGowan. She had her mother call Cousin Brucie that night. But, program director Rick Sklar, ever the master promoter, could see the advantages of stretching out this drama a while longer. Even though WABC recovered the medal within a few hours, Rick arranged for the girl to stay overnight, safely secluded with her mother in a hotel room while the station continued to broadcast appeals for the medal's safe recovery. As you would expect, this became a media sensation and WABC held all the cards. By the time the following evening rolled around, everyone was listening to WABC to see if the medal would ever be recovered. Twenty-four hours after its initial loss and subsequent recovery, WABC reunited the medal with Ringo over the air. It was a publicity bonanza for the station. of Angie McGowan giving Ringo his St. Christopher's Medal back! When The Beatles played at Shea Stadium in 1965, WABC ran a contest for a listener to design a medal to honor the group. "The Order of the All American" medal was awarded to each of The Beatles by Bruce Morrow. Again, the remote microphones were invaluable in giving WABC easy access to The Beatles in their hotel room for the awarding of these medals. It was all done over the air with much fanfare and the statement "another Beatles exclusive from WABC". and Dan Ingram report live from inside the hotel. 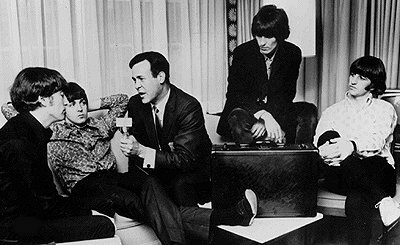 By the time of the second Shea Stadium concert in August of 1965, WABC again staged a remote broadcast from The Beatles' hotel, this time the Warwick. The 1965 concert also featured Cousin Bruce Morrow as one of its emcees. This is the concert frequently seen in documentaries about The Beatles where it is impossible to hear anything other than the screaming of fifty five thousand crazed fans. 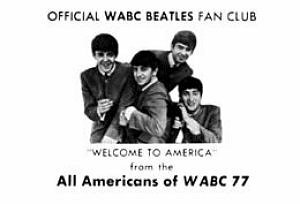 This was the peak of Beatlemania and both WABC and WMCA benefited from it. By 1965, WINS was no longer playing music so the "Fifth Beatle" Murray the K moved to WOR-FM in 1966. It is important to note that WMCA also had many successes and its own exclusives. In fact, the WMCA disc jockeys were featured on the back of a record sleeve for The Beatles single "I Want to Hold Your Hand" (flip side "I Saw Her Standing There"). WMCA disc jockeys were also at the Shea Stadium concerts. And, another success for WMCA was the fault of WABC itself. Roby Yonge, a WABC disc jockey who knew he was about to lose his job, used his overnight radio shift to spread rumors about the "death" of Paul McCartney in 1969. With that huge nighttime radio signal, which easily covered thirty states, this was an embarrassment for the station. Roby was fired while still on the air, but the ripple effect continued for some time. As a result of this broadcast, "American Contemporary Radio" (the ABC News service carried by WABC and many other hit music stations in 1969) carried these newscasts the following morning. Note how the importance of this story moved to a higher profile position in the newscast as the morning progressed. This indicated how this story became bigger as the consequences of Roby's broadcast became more significant. American Contemporary Radio on "Paul is dead"
Even though WMCA was soon to become a talk station, it didnt waste any time capitalizing on this WABC mishap. They distributed buttons with the inscription "Paul Lives" imprinted on them. The Beatles chapter of the WABC story is an exciting one. Did WABC win the "war of The Beatles" over rival WMCA? Ultimately, WABC defeated WMCA in the rock radio ratings war but during the heyday of Beatlemania in the mid 60s I believe it was too close to call. Certainly the incident where Beatles fans outside the Delmonico hotel were singing WABC jingles gave WABC the edge. But, having your disc jockeys on a Beatles record sleeve was also an enormous achievement. Still, WABC benefited immeasurably during the entire era. Its overall ratings continued to climb which was always the real goal. And, to this day there are many people who, when they think of WABC, think W A "Beatle" C! This aircheck features several WABC Disc Jockeys in 1964. It begins with a terrific Scott Muni promo. Bob "Bobby D" Dayton is also featured here. Most noteworthy is the tremendous emphasis being placed on The Beatles at this time. WABC is referred to as W A "Beatle" C, there are LOTS of Beatles songs being played and special Beatles promos are used constantly. We love you Beatles... Oh yes we do.....!! Cousin Brucie promo for 100 tickets to The Beatles Show at Shea Stadium! Cousin Brucie promo for a pair of tickets at the New York Paramount!